Those who read my writing attempts occasionally, know that I thoroughly hate everything that has the appearance of a serial or when prequels and sequels are being produced just to exploit the story even further. So, don’t panic while reading the following statement. 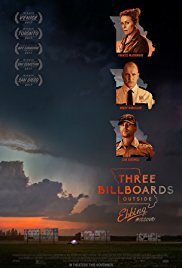 I hope they’ll come up with a sequel to “Three Billboards outside Ebbing, Missouri“. A continuation of this brilliant story where we’ll learn how Mildred (Frances McDormand) and Dixon (Sam Rockwell) handle the case. “Three Billboards outside Ebbing, Missouri” is about anger, rage, and helplessness. The anger about an unsolved case with Angela, the daughter of Mildred, being raped and burned alive by one or more unknowns. And after several months Mildred has come up with the bright idea to denounce the failure of the judicial investigation. And this by unabashedly spreading the message about it, on three billboards with Chief Willoughby (Woody Harrelson) as the main target, solely because of his leading position as Chief. Sublime acting from Frances McDormand. Even though Woody’s name is written on the billboard in huge letters, his contribution isn’t really decisive. To my surprise, he also gets out of the picture halfway through the film. In the first place, it’s Frances McDormand who demands the most attention. And she does that in a stunning way. A bitter woman who’s tired of waiting for an arrest. Mildred is under the assumption that no effort is made by the corps to follow any clue or performs real police work. In her eyes, the police officers are a group of racist dipshits who spend their days harassing Afro-American fellow citizens. And such a golden statue can also be reserved for Sam Rockwell. His acting is simply magisterial. Dixon is an aggressive hillbilly who likes to beat up minorities and appears to be drunk constantly while doing his job as a policeman, knowing it’s tolerated by his superior. A not so quite intellectual overweight man. And Dixon’s stupidity sometimes creates comical situations. And finally, there’s Woody Harrelson. An actor after my own heart (who had stolen it already because of his participation in the sitcom “Cheers“) who always plays his roles with so much flexibility and professionalism. In contrast to the confused and sometimes cruel character from “The Glass Castle“, Chief Willoughby is an honest person who’s sincerely worried about the case of Mildred’s daughter. All in all, these are three parts that are played in an excellent and marvelous way by these actors. This film is already commendable because of that. A brilliant movie. Go see it !!!! But it is also the intelligently written script that makes this film worthwhile. It’s indeed a film full of heavy themes. The injustice in this world and how people deal with it. The processing of an immense grief. There are also uncomfortable moments full of aggression and threats. And yet there is always a laconic undertone that is peppered with thoughtful, ambiguous humor. And these different moods alternate at breakneck speed. Some scenes change from aggressive and threatening, into humorous and emotional. “Three Billboards outside Ebbing, Missouri” is a gem of a film I’ve enjoyed tremendously. And believe me, I’m looking forward to seeing it once more.